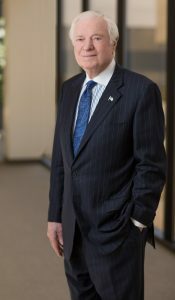 Alan B. Miller, founder, chairman and CEO of Universal Health Services (UHS), will be presented with Freedoms Foundation’s Distinguished Citizen Award on April 15 at An Evening with Freedoms Foundation. Headquartered in King of Prussia, UHS has more than 87,000 employees and through its subsidiaries operates 350 inpatient acute care hospitals and behavioral health facilities and 30 outpatient and other facilities in 37 states, Washington, D.C., Puerto Rico and the United Kingdom. It was recognized again in 2019 as one of the World’s Most Admired Companies by Fortune, and last year was ranked No. 268 on the Fortune 500. Alan Miller has received numerous awards for his business and charitable activities. He was named Entrepreneur of the Year in 1991 and for 15 years was listed by Modern Healthcare as one of the “100 Most Influential People in Healthcare.” He is a graduate of the College of William and Mary, was commissioned in the U.S. Army, and earned his MBA degree from the Wharton School of the University of Pennsylvania. For a full biography, click here. Alan Miller took a moment to talk with Freedoms Foundation about influences on his life and leadership style, and to offer advice to healthcare leaders and practitioners. Question: Who were the people who influenced you most? Alan Miller: There are many in my life who have had a guiding influence on me. From a personal perspective, my mother and father were very loving and made me feel that I was a special person. My wife Jill has always been my strongest supporter and confidante. We recently celebrated our 50th wedding anniversary and I can say that I would not be the person I am today without her. From a business perspective, I greatly admire the teachings of legendary basketball coach John Wooden. In addition to Wooden’s remarkable coaching career, he was a man of incredible character and humility. He would say to his players, “Give me 100 percent. You can’t make up for a poor effort today by giving me 110 percent tomorrow. You only have 100 percent, and that’s what I want from you right now.” Wooden would often say that it is not the winning, but the fact that the team was all giving their maximum effort. It was about doing your very best at all times. Wooden’s approach is relevant in business today. Wooden taught his players to compete at a furious pace with no stalling, time-outs or slowdowns. Get the ball; run the ball; shoot the ball. The media sometimes called it a “fire wagon” style because the running never ceased. This is a result of preparation, practice, conditioning and the will to win! These qualities transcend basketball. In business, laser focus on the task at hand, be fully prepared and out-work your competitors. Successfully applied, these qualities foster success off the court. Question: Freedoms Foundation shares your appreciation of George Washington. What do you most admire about him? Alan Miller: Several leaders influence my leadership style, but none more than the first president of the United States, George Washington. I am a student of history and have studied the courage of our nation’s founding fathers and their bold entrepreneurial style. George Washington had many incredible qualities. I would say that No. 1 was Washington’s courage and his ability to lead by example. Further, I have learned from him the importance of perseverance, the power of remaining calm under pressure and the value of being ambitious. Question: As a recognized leader in the health-care field, what advice do you have for the health-care practitioners and leaders of tomorrow? Character is destiny – a person with good character will always be better off in life. Choose your friends carefully because you are known by the friends you keep. Hard work is critical and if you are going to do something, do it well. Hire the best team possible – build trust and rally the team to focus on a common goal. Question: Any thoughts you’d care to share on receiving the Distinguished Citizen Award? Alan Miller: As a healthcare company, one of the populations that we are honored to care for is our nation’s military – active duty, veterans, and their families. In collaboration with Military Command, UHS built and delivers specialized programming under the banner of the UHS Patriot Support Program that serves the behavioral healthcare needs of the military and their families. It is not uncommon for members of the military to struggle with depression, post-traumatic stress disorder (PTSD), addiction or other behavioral health issues. Through our UHS Patriot Support Program, we provide specialized care to help them through multiple deployments, being away from their families and also assisting them with the transition to civilian life. In 2018, we were honored to provide care for 7,500 active duty and veteran military, supporting them on their journey to wellness. I served in the U.S. Army, 77th Infantry Division and I am very appreciative of what our armed forces have done for this country. Now it is our turn at UHS to serve them.